Mhairi-Claire Doolan, who was 34 weeks pregnant at the time, was stunned when the suited man LAUGHED in her face as she pleaded with him to let her sit in her own seat. 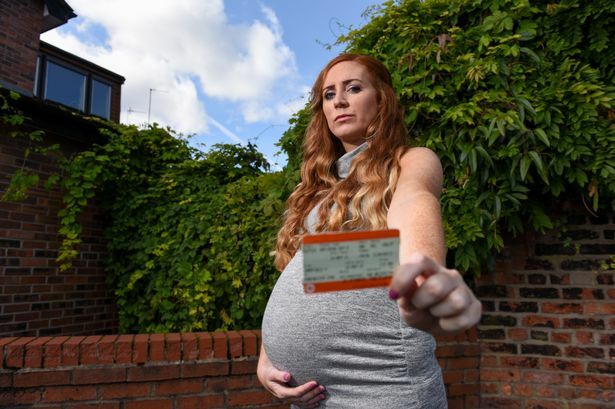 An expectant mother was forced to stand on a train after a businessman refused to give up his seat – despite her showing him her ticket proving she had booked it. Mhairi-Claire Doolan was stunned when the suited man LAUGHED in her face as she pleaded with him to let her sit in her own seat. The 29-year-old, who was 34 weeks pregnant at the time, was then forced to stand for more than 30 minutes following the shameless man’s refusal to move. Ms Doolan said: “I was already tired and in pain and to be honest I’m so heavily pregnant I should probably not be travelling by train, so I made sure I had a seat booked. “I told him I had that seat booked and positioned myself so that he could see I was pregnant but he just ignored me. Ms Doolan was about to board a train from Birmingham to Manchester when she was barged out of the way as people raced to get on board. After clambering on last, the exhausted mum-to-be found her seat but spotted a man in his late 30s or early 40s sitting there who refused to move. The recruitment manager said: “I couldn’t believe it. I am the size of a small house at the moment so he couldn’t have failed to see I was pregnant, he just didn’t care at all. “I’ve had people sat in my seat before like that and usually left it but on this occasion I really needed the seat as my back ached so much. “Even worse, no one did anything to help or intervene and no one offered me their seat. People just averted their eyes and pretended they hadn’t seen it. “I would have argued for my seat more but he was with a friend and if I didn’t want to end up having an argument with him and then having to sit with his friend. “I was left standing for more than half an hour, which was almost unbearable but I didn’t want to ask for someone else’s seat and get laughed at again. When a ticket inspector later came round, the man had got off but Ms Doolan still pointed out to him what had happened and asked if she had been wrong to request the seat if the electronic reservation system was broken. Ms Doolan said: “The whole thing has made me question the way I act around others. I always thought it was an unspoken rule that you give up your seat for pregnant ladies or you allow them to get on the train first. It’s just polite. “But everyone just pushed me out of the way to get on the train and this man just laughed in my face when I said I had reserved the seat – maybe I have been being too nice. “Maybe this is how people travel now? But my mum would be angry with me if she ever saw me treating people like that. “My boyfriend Dan was very angry about it. He was fuming that this man could do this to me. He is the complete opposite person. Previous article Meet Braun’s no touch + forehead thermometer. The first thermometer with both no touch and touch functions. Meet Braun’s no touch + forehead thermometer. The first thermometer with both no touch and touch functions.